Recently I moved into a new apartment here in Dallas, and like everyone else, I had to find electricity. No one wants to shower in the dark, after all. But I had forgotten what a pain moving really is. I lived outside of the United States for almost 5 years, so this was my first new apartment in literally 16 years. All the options for utility companies blew my mind. I reached for the Excedrin. Should I get prepaid energy or postpaid for my apartment? Was TXU best or Ambit Energy? What rate plan should I choose? What did all the fine print mean? Was I really going to get $.09/kwh or not? I reached for the Excedrin again, found I had already taken it all, and drove fast to Walmart to get some more. I’m positive many of you can relate to this. Getting electricity for an apartment is as bad as buying a new car. If you’re in doubt and feeling desperate, talk to the experts. What size apartment will you live in? How many people will live with you? Can you afford to pay a deposit? With those answers, he knew exactly where to go. He set me up with the right utility company for my situation. I just got my first bill, and for one month I’m paying only $29.13. I can handle that. I’m happy here in my new apartment. Postpaid vs. Prepaid – Postpaid energy is perfectly fine. I like getting my bill at the end of the month just like always. Lower Electric Bills – Common sense is common sense. Turn off your lights when you’re not using them. Use the ceiling fan instead of the a/c. Your bill will be much lower. 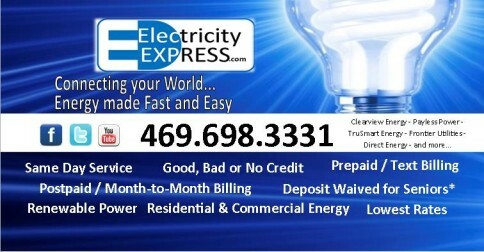 Great Customer Service and Electricity Express – Some people really are willing to help you out. There are still nice people out there. What else can I say? The people at Electricity Express are class acts. Don’t take my word for it. Give them a call, and you’ll appreciate how hard they work for you. Isn’t it nice when you find someone who will make your life a little easier? Discover a utility company that really does care about its customers. Take advantage of the blog, which gives helpful tips on saving money and the environment. Electricity Express really does have your back.